Students will interpret the United States business cycle in terms of a piecewise function. They will analyze specific points, slopes, and relative extrema of different sections of the cycle and formulate equations that represent the United States’ real GDP from historical data. Students will then relate the equations created from data given with the learned knowledge of economic reasoning related to real GDP. Explain how changes in economic conditions affect real GDP. Generalize the business cycle as a piecewise function. Discuss the business cycle in terms of a function. Find the extrema of a function and use it to compare economic conditions. Write a linear equation in slope-intercept form given two points. 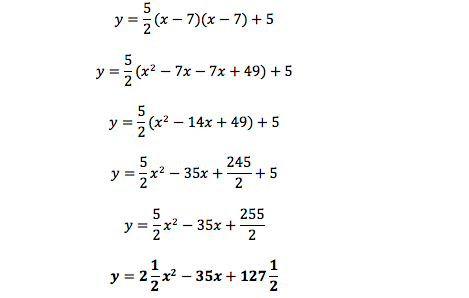 Use the vertex and standard form of a quadratic equation. describe in words what these functions look like and give a scenario in the economy that matches what they represent. Which of the following would be calculated in GDP? Sally volunteers to walk the neighbor’s dog. US citizen buys souvenirs in Spain. Grandparent buys a gift for grandchild. Child makes a birthday cake for her brother. From the following graph, how many pieces would you break the function into in order to write a piecewise function and describe in words what each piece’s function would be? Three pieces; the first piece would be an upward facing quadratic function, the second piece would be a wider downward facing quadratic function, and the third piece would be a positively sloped linear function. Recap that the peaks and troughs of a business cycle are found by the vertex of quadratic functions. The vertex of that function is either a minimum or maximum. It is a minimum (a trough in a business cycle) if it is a positive function that opens upwards; it is a maximum (a peak in a business cycle) if it is a negative function that opens downwards. These functions can help see how quick or slow the recession or recovery is in the economy. Display Slide 29. This is the real GDP of the United States from 1929-2010. Although the business cycle has its ups and downs, the overall growth of real GDP is a sign of a successful economy for America. The patterns seen in the 85 years shown in slide 29 demonstrate that history repeats itself. The economy as measured by real GDP is just one of the many patterns that can be explored with math. In the past 100 years, moments in history like the Great Depression or more recently the housing boom and crash has heightened our awareness of the peaks and troughs in our economy. Economically speaking, these highs (peaks) and lows (troughs) are telling of the Real GDP which many economists use to measure the successfulness of a countries economy and well-being. Students can use their knowledge of mathematics in using the vertex of a quadratic function, applying properties of linear equations, and analyzing non-linear functions to quantitatively describe and compare different cycles in the economy. Students can then compare present situations with those in the past. Introduce the concept of gross domestic product or GDP by showing the clip https://www.stlouisfed.org/education/economic-lowdown-video-series/episode-7-gross-domestic-product . Market value: the price paid for a good or service in the marketplace. Final goods and services are goods and services produced for consumers or end users. Give an example of when people purchase flour at the store to produce cookies or bread at home it is counted as part of real GDP but when flour is sold to bakeries that produce the baked goods for retail, the baked goods are counted as part of real GDP but the flour itself is not. Intermediate goods are not counted as part of real GDP but go into the production of a good or service. The value of the flour used to produce the bread at the bakery will be reflected in price of the final product when it is sold to the end user. In the example above, flour when used by the bakery, is an intermediate good. Have students use what they have learned in the video to classify examples of goods or services that would or would not be included in the calculation of real GDP. Divide the class into two even groups (have a member of the smaller group go twice if there are an odd number of students). Have them line up in two rows in front of the board. Give each student a copy of Activity 1. Distribute a paddle to the first student in each row. Instruct students that a series of slides will be displayed. For each slide the student holding the paddle must decide if the good or service would or would not be included in the calculation of real GDP, then display the appropriate side of the paddle, and then return to their seat. For each correct paddle answer, the team gets a point. The team with the most points wins. Display Slides 3-17, one at a time. After each team member holds up the paddle, ask the class what the correct answer is. Have students record the correct answer on Activity 2.
Business investment—When the economy is growing, businesses tend to expand and spend more on new plants and equipment, produce more products, and hire more workers. When the economy is contracting, businesses spend less on expansion, may reduce production, and lay off workers. Consumer expectations—If consumers expect the economy to expand resulting in more jobs and increases in income, they will more likely buy more goods and services. If consumers expect a contraction, they may save more and spend less. Interest rates and credit—When interest rates are low, businesses tend to borrow to make new investments and consumers will use more credit to purchase goods and services. The reverse is true when interest rates rise. External Shocks—External shocks include things such as droughts and disruption of the oil supply. These have negative impacts on the growth of the economy. 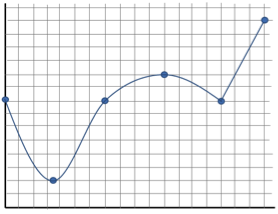 Tell students that these fluctuations in real GDP can be shown on a graph. Display Slide 19. Explain this picture is called a business cycle. A business cycle is the fluctuating levels of economic activity in an economy over a period of time measured from the beginning of one recession to the beginning of the next, usually measured by real gross domestic product. Ask the students what function would best represent the graph of the business cycle shown in Slide 19. (Answers may vary from linear, quadratic, cubic, trigonometric; the best answer would be a piecewise function). Explain to students that parts of a business cycle can be compared to quadratic parabolic functions and other parts of the business cycle can be compared to linear functions. This is why looking at the business cycle as a piecewise function can help us better analyze specific sections more accurately. Additionally, in the business cycle, the peaks and the troughs are crucial turning points for the economy. These peaks and troughs are the vertices on the parabolas. Remind students that in real data, the x-axis displays the time in years and the real GDP is represented on the y-axis. Students should already be familiar with (x, f(x)) notation. Remind students that the standard form of a line is f(x) = mx + b or y = mx + b and that the standard form of a quadratic function is f(x) = ax2 +bx +c or y = ax2 +bx +c and when it is in the form f(x) = a(x – h)2 +k it is the vertex form where the vertex is represented by (h, k). Use Slides 20-24 to discuss how the function may at first look difficult to write a rule for but can be broken into pieces to simplify talking about the function quantitatively. For each piece of the function, work through the mathematics of how to write the function over that domain. Display Slide 20. Ask students what type of functions they see. Display Slide 21. Notice that from 1< x < 4.5 the function resembles a quadratic function. Use the vertex formula from a quadratic function y = a(x – h)2 + k along with the point (2, 30) and vertex (3, 40) as seen on the graph to solve for a. The point represents (x, y) and the vertex represents the values for (h, k). With the a just found and the given vertex, write the quadratic function for all points on the curve. The equation could also be simplified to be represented in standard form. Display Slide 22. Repeat same process as in step b except the vertex this time is (7, 5) and another point on the curve is (5, 15). Notice that from 4.5 < x < 11 the function resembles a quadratic function. Use the vertex formula from a quadratic function y = a(x – h)2 + k along with the point (5, 15) and vertex (7, 5) as seen on the graph to solve for a. The point represents (x, y) and the vertex represents the values for (h, k). Display Slide 23. Notice that from 11 < x < 14 the function resembles a linear function. Use two points on the line to write an equation in slope-intercept form of y = mx + b. Use one of the points and the found slope to solve for the y-intercept (b). Write the linear function for all points on the line. Discuss with the students that the a coefficient controls how wide or skinny the quadratic function opens. The larger the number, the skinnier the curve. When a is positive, the function opens up, and when the a is negative the function opens down. What was happening in the United States during the time frame of the second graph (slide 28)? Ask if anyone knows what caused the peak and recession? (Answers may vary; one response may relate to the housing market – the housing boom and crash had a big role in this rapid increase and then significant drop). Explain that the two graphs represent two different periods of recession in the history of the United States’ economy. Yet, they have very similar functions that represent them. In fact, the recession had the same coefficient on the quadratic functions which means the real GDP reacted the exact same for both time periods. Additionally, recovery for both was in almost the same manner as seen by the relative similar slopes on the linear function.